What are the main differences between the various countertop surfaces? Solid surface is comprised of acrylic material with aluminum trihydrate. This creates a very durable, non-porous surface. Quartz consists of approximately 80% natural quartz crystals, suspended in a polymer compressed under extreme pressure. The result is a non-porous surface that is extremely scratch resistant. Granite is a 100% natural product mined straight from the earth. It is mined in large blocks, cut into slabs, polished, and delivered to our facility for manufacture into a countertop. Dekton is a surface material made of ultra-compacted glass, porcelain, and quartz. This ultra-compaction contributes to the material’s low porosity, making it low-maintenance and a life-long product. Etching happens when acid comes in contact with a marble, limestone or unsealed granite surface. This causes a chemical reaction, which damages the polish and roughens the surface. Green marbles, such as the ‘jades” from China are resistant to etching, and granite is impervious to most common household acids. For everyday cleaning there are a number of products available on the market specifically designed for natural stone (such as Black Diamond brand stone cleaners), or a solution of 2 parts water to 1 part Simple Green works well. A very simple method is to use warm soapy water and wipe the entire counter surface on a daily basis. You do want to avoid common household cleaners that have a bleach or ammonia base. These cleaners can damage your sealer and leave your counters more susceptible to stains. What countertop finishes are available? Solid Surface comes with a standard “matte” finish. “Satin” and “polished” finishes are available for an additional charge. 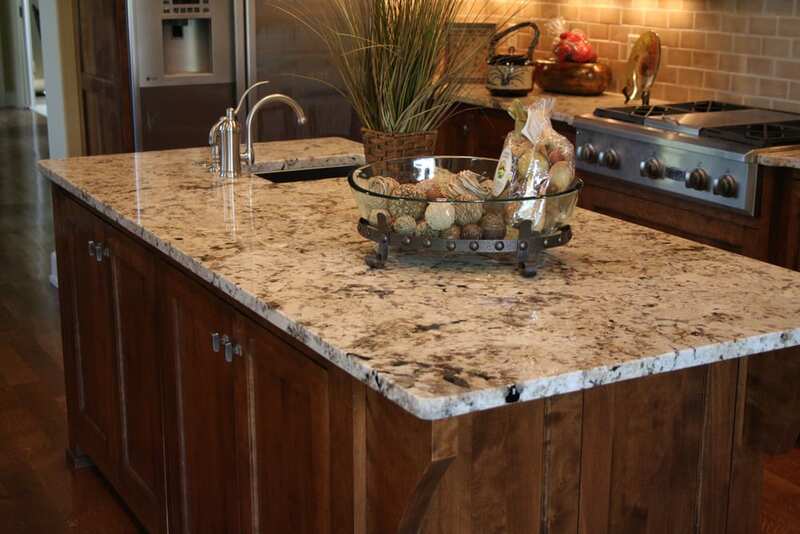 Quartz and granite come with a standard “polished” finish. “Honed” and “leather” finishes are available with some brands and colors for an additional charge. 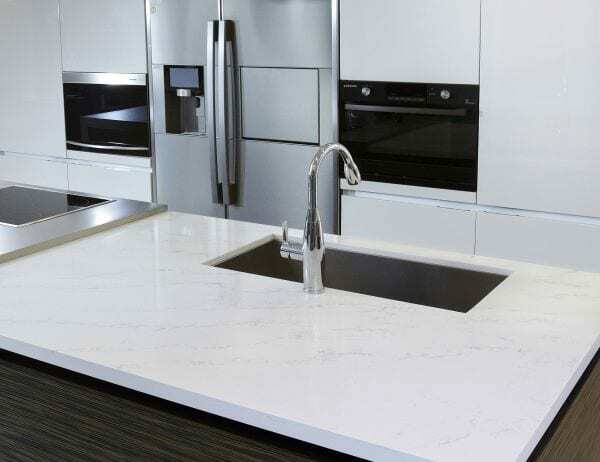 How do the prices of solid surface, quartz, and granite compare? A standard counter typically costs substantially less in solid surface material. Quartz, Dekton and granite have about the same price range and are generally more expensive than a solid surface counter. Discussing granite care and cleaning can sometimes be a little confusing. We will focus on granite countertop care and not granite used for other applications such as floors or wall cladding. It is important to recognize that not all granite necessarily needs to be sealed. For example, a tight grained granite may never need sealing because of the natural properties of thatparticular piece of granite. However, we recommend every countertop be sealed with a quality non-toxic sealer. The main reason to seal granite is to protect the stone from staining and water absorption. Many food items such as red wine, cooking oil, grease, mustard, coffee and tea can and will stain granite countertops. Most stains can be removed depending on the type of stone and depth of penetration. At Premier Countertops, we will apply the sealer to protect your stone counters. This initial sealing will not last forever and you must reapply sealer on a regular basis. For everyday cleaning there are a number of products available on the market specifically designed for natural stone, such as Black Diamond. A solution of two (2) parts water to one (1) part Simple Green also works well. The simplest method is to use warm soapy water and wipe the entire counter surface on a daily basis. You do want to avoid common household cleaners that have a bleach or ammonia base. These cleaners can damage your sealer and leave your counters more susceptible to stains. How often do I apply sealer? We recommend that you seal your stone countertops anywhere from every six (6) months to once a year. The frequency of sealing is typically based on the type of stone you have selected and the amount of traffic in the kitchen. What type of stone sealer should I use? Make sure you purchase a non-toxic sealer. The sealer should say on the bottle that it is safe for food preparation areas. If it doesn’t, investigate further and please give us a call. Is it possible to over seal my granite? Yes! It is important to understand that while regular sealing is important, too much sealer can become a problem. Once a week or even once a month sealing can begin to build up in your granite material and begin to make the granite surface appear cloudy and dull. If this build up occurs we do recommend that you contact a stone restoration specialist to come out and clean and reseal your granite professionally. It’s hard, nonporous surface makes quartz surfacing simple to clean. In most cases, soap and water or a mild detergent is all that is required to maintain its luster. If necessary, a non-abrasive cleanser such as Soft Scrub Liquid Gel with Bleach or Comet Soft Cleanser Cream With Bleach can be used along with a non-scratch or delicate scrub pad such as blue Scotch-Brite sponge. Adhered materials like food, gum, nail polish, or dried paint can be scraped away with a plastic putty knife; any marks left by the blade can be removed with Soft Scrub Liquid Gel and a blue Scotch-Brite pad. Thoroughly rinse the surface with clean water to remove residue. While quartz surfacing does not require sealants or waxes to maintain its luster, occasional polishing with Soft Scrub Bleach Gel or Comet Gel will keep the quartz surfacing looking its best. Please understand that HONED finishes will require more daily maintenance than polished finishes. Since there is more exposed surface area with honed finishes, metal marks, fingerprints and other signs of daily living will show on honed material. Most of these marks can be easily removed with little effort and non-abrasive cleaning products such as Soft Scrub Liquid Gel. For tough stains, work the area with a blue Scotch Brite pad. Drano, Liquid Plumr, oven cleaners and floor strippers will harm quartz surfaces. Do NOT use these or any other harsh chemicals on your surface. Do NOT use crock pots or electric skillets while in direct contact with your surfaces. Always place them on a trivet or cutting board to protect your countertop. (Review your electric appliance manual as a reference.) Quartz is a stone product. As with any natural stone, certain exposure to heat may cause cracks due to thermal shock. No, all warranties are not the same and we encourage you to read the manufacturer’s warranty before you make your decision. Granite does not come with any warranty past the initial one year Premier Countertops craftsmanship warranty. How do i get color samples of surface products? We have about 90% of all solid surface and quartz samples. We encourage you to stop by our showroom for FREE samples. Each product page has links to our manufacturers’ websites were you can view their color selections. All samples are FREE, just stop by our showroom. Which countertops are heat resistant? Although we never recommend placing hot pots or pans directly on your countertop surface, Granite and Dekton are able to withstand those high temperatures without burning, scorching or cracking. You’ll never have to worry about your Crock Pots degrading the quality of your surface. Quartz and solid surface are also heat resistant, but are not heat proof. Although all products can withstand high heat, we recommend using a hot pad or trivet under pots and pans. Is it safe to put a slow cooker or electric skillet on my stone countertop?